Hercules, the leader in mobile DJ controllers for PC/Mac®, is proud to announce the new DJConsole RMX 2, the newest controller and worthy successor to the Hercules DJ Console RMX. Available mid-August 2012, the DJConsole RMX 2 is perfect for fans of the original DJ Console RMX and the talented new generation of mobile DJs looking for professional gear combining performance, versatility and mobility at an affordable price. Hercules invites DJing communities to live the DJConsole RMX 2 experience from a unique perspective during the World Tour: It’s Your Turn event, which will run from the end of summer until the end of the year, allowing DJs to practice mixing, learn new techniques, enhance skills, participate in DJing contests, and team up with emerging DJing artists to share their unique passion. Over the past four years, the original Hercules DJ Console RMX has become the benchmark device in its category – a DJing controller for PC and Mac available for less than $300. 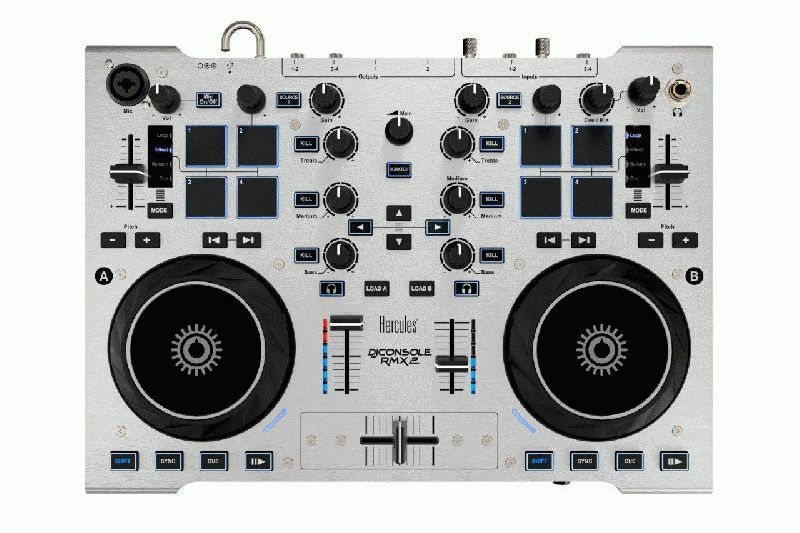 Thanks to its user-friendly controls, audio interface featuring inputs and outputs and its metal case, the DJ Console RMX has been adopted by DJs embracing computer DJing that have now trained and evolved using this technology. Today, Hercules’ passion for this technology burns brighter with the release of the second generation of this device: the Hercules DJConsole RMX 2, the ideal instrument for emerging DJs to express creativity, work on mixes, turn ideas into music, hone performance and conquer audiences. The Hercules DJConsole RMX 2 is the first controller in its category boasting a high-resolution 96 kHz/24 bit audio interface for Windows® (ASIO) and Mac® (Core Audio). For audiences and DJs alike, the device’s 96 kHz/24 bit audio capabilities offer audio quality and dynamic sound that are far superior to a 44.1 kHz/16 bit interface. The DJConsole RMX 2 is a part of the current DJing trend allowing DJs to create high-resolution audio mixes, as a growing number of DJing software applications (VirtualDJ® 8, Traktor® Pro, Ableton) become compatible with a 96 KHz/24 bit resolution. The Mastered for iTunes program provides a number of 96 kHz/24 bit digital audio tracks, and computers running Mac OS and Windows 7 64-bit can handle this resolution without increasing latency. DJs wishing to distribute their music as high-resolution audio files using programs such as Mastered for iTunes can easily create high-resolution music tracks with the DJConsole RMX 2. With its metal casing, the DJConsole RMX 2 is a solid device that will live up to the most intense mixing sessions and transport conditions. Its compact measurements (35 x 25 cm) and limited weight (2.6 kg) make it ideally suited to following mobile DJs on the road; in addition, the DJConsole RMX 2 is provided with a carry bag. The DJConsole RMX 2 will be supplied with two DJing software apps: DJUCEDTM 40° and VirtualDJ® 8 LE. VirtualDJ 8 LE combines efficient mix controls with a user-friendly graphic user interface, and also offers 24-bit/96 KHz audio resolution. (Until VirtualDJ 8 LE is released, RMX 2 owners will be able to use VirtualDJ 7 LE). DJUCED 40°, the new DJ mixing software, offers unequalled audio clarity combined with 24-bit/96 KHz audio resolution. It displays the mix in a streamlined graphic user interface, allowing DJs to concentrate on their music.